For the holidays, a slice of a good brie and a dollop of homemade fig marmalade would pair well with these crackers, or my Beetroot Pesto/Hummus. If you like to keep it basic, just go for butter, cheese and cucumber. I won’t be much longer today, cause I’m in desperate need of spending a couple of hours in horizontal position in front of some cheesy tv show. I’ve attempted to photograph so many recipes this week I don’t know what I was thinking??? Some kind of hubris got hold of me. Let’s just say I have the following month’s blog posts pretty well covered for. What have you been up to this week? 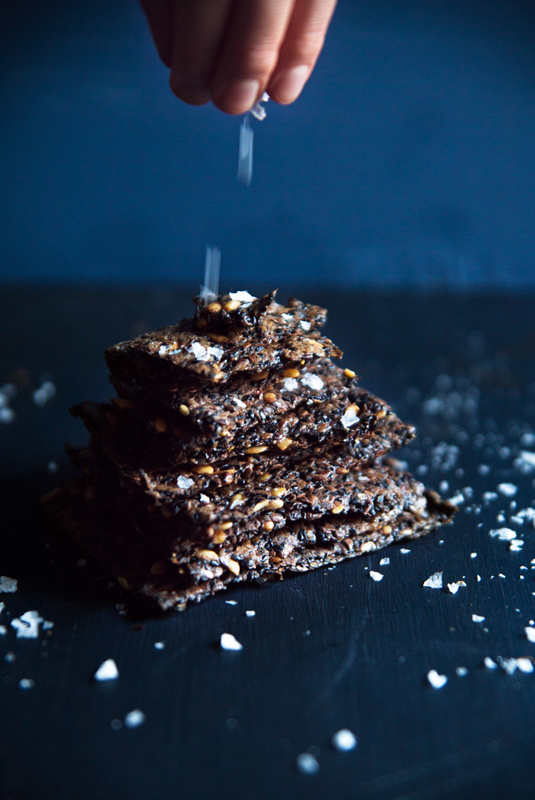 Notes: 1) I like to use black sesame seeds because they give the crackers a deep and lovely color, and are also more intense in flavor. 2) The caraway seeds are an optional flavoring. I like to sprinkle a couple on top. You can also try rosemary, thyme or keep it plain. Heat oven to 150’C. Line a baking tray with parchment paper. Mix all dry ingredients except caraway seeds and flaked sea salt in a bowl. You could crush sunflower seeds/pepitas/melon seeds in a mortar first, but it’s not necessary. In a small sauce pan, bring 3 dl / 300 ml water to boiling. Pour water and oil over the dry mixture and mix properly. Quickly spread on a baking tray and flatten out using a wet glass bottle. Continue flatten out and even out the corners with your hands. Keep a little water nearby to wet your hands so they don’t stick to the batter. Try making it as thin and even as possible. Sprinkle some flaked sea salt and cumin seeds on top before baking. Bake for about 20 min in the middle of the oven. Take out the tray and cut the batter into rectangular pieces (if still to wet then just wait a little longer with this step). Then flip the crackers over, and bake for another 20-30 min. After around a total of 50 min, the crackers should be fairly dry but not browned! Switch off the oven just before you think the crackers are done, and leave the baking tray inside to allow the crackers to slowly dry and cool. This will make them super crispy. Store in room temperature. Last for, like, a long time. Enjoy! These look fantastic. I wish I had a plateful right now with some cheese. Sounds delicious! I’m having the opposite week…get zero blog posts done. Awful rainy and dark weather we’ve been having has put a damper on my food photography! Those crackers look amazing, Agnes! The pictures are stunning too. I love how your mistake of using too much oil turned into something great. It’s a reminder that sometimes the truly wonderful things happen when we make mistakes. Well done. 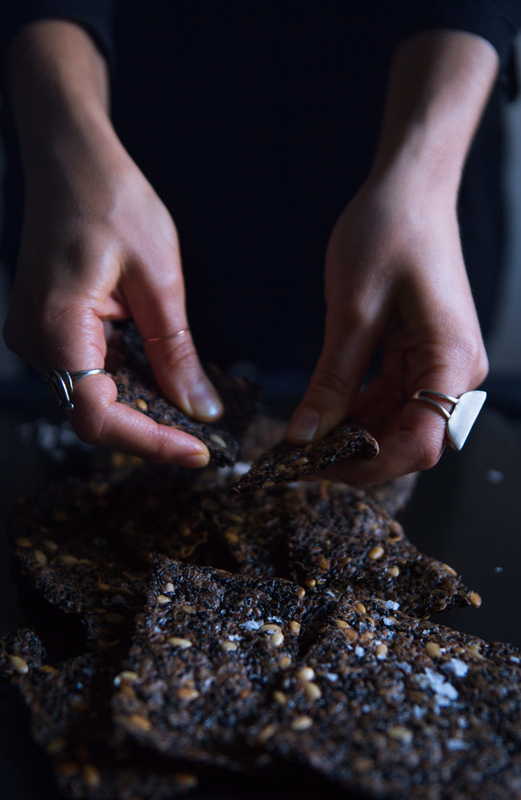 What delicious looking seed crackers! I can definitely see myself making the recipe – they look perfect to be accompanied by a good cheese and dip. You’re totally right ;) That’s how I like to enjoy them. Have a great day!